18 packs per box, 5 cards per pack. - One Cup Contenders and One Calder Contenders short print! - One Calder Contenders Signature! - One NHL Ink autograph! 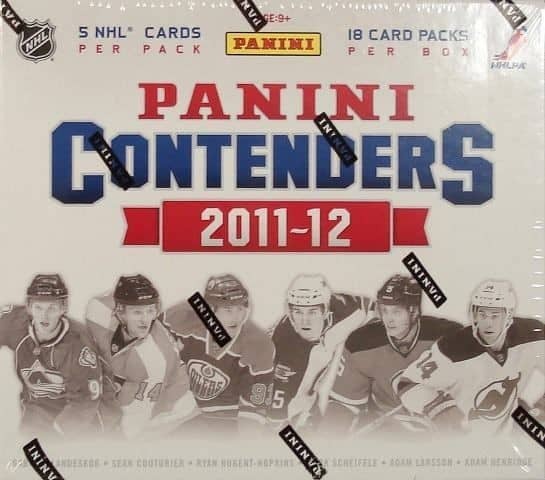 Produktinformationen "2011/12 Panini Contenders Hockey Hobby Box NHL"
- Two Cup Contenders Gold Auto Patches! - One Calder Contenders Auto Patch! - Two Calder Signature Patches! - 20 Calder Contenders Signatures! - One NHL Ink Duals! - One booklet card featuring up to SIX superstar autographs! GABRIEL LANDESKOG, JOE COLBORNE and many more! - Look for Original Six Combos, featuring past and present stars from each of the NHL's most legendary franchises! - Track down Contender's Match-Ups, highlighted by a pair of stars from the game's most storied rivalries! And watch for six players from your favorite NHL teams in Starting Line-Ups! - NHL Ink: Look for Single, Dual and Triple cards feature ON-CARD autos of NHL legends, stars and freshmen! - Multi-signed booklet cards! Each booklet contains between four and six autographs of top NHL stars! - Cup Contenders: shines the spotlight on today's top stars, like Tim Thomas, Roberto Luongo, Sidney Crosby, Steven Stamkos and more! 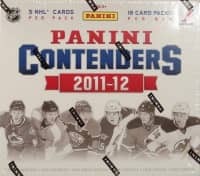 Weiterführende Links zu "2011/12 Panini Contenders Hockey Hobby Box NHL"
Fanbewertungen für "2011/12 Panini Contenders Hockey Hobby Box NHL"